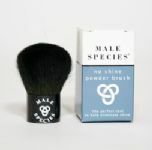 Let your skin look its best with Male Species face enhancers. Skin will look healthier and minor flaws will disappear. Leaves an undetectable natural look. Balances uneven skin tone and imperfections, corrects problem areas like tired eye dark circles, redness, blotchiness, shaving nicks, blemishes and scars. Application tips: The general rule for cosmetics is "less is more" - very little goes a long way. Always apply cosmetics very sparingly to enhance the skin and leave a natural look. Blend, blend, and blend again.the key to a healthy, natural look is to blend (massage into skin) until the product melts in. If you can see a trace of cosmetics, you have put on too much and have not blended enough.